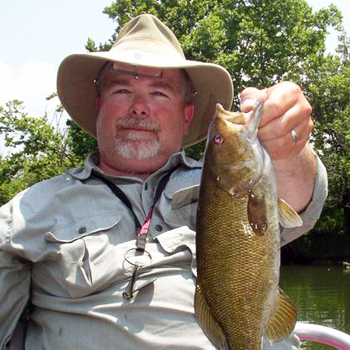 Randy Ratliff is an Orvis Endorsed guide. He is based in Northeast Tennessee and calls the South Eastern Appalachian rivers and streams his home waters. Randy has been fishing these waters most of his life and guiding on them for the past six years. Randy has a love and passion for fishing, which was passed to him by his father and grandfather. Whenever they had spare time he and his father would fish the rivers, lakes, and ponds near their home chasing smallmouth. During his teenage years his grandfather was the influence in the migration towards using the long rod. His grandfather tied his own flies using feathers and fur from around the family farm. This is where he learned his second passion, fly-tying. When not on the water, Randy can be found at the tying bench fine-tuning his proven local fly patterns. He was the featured guide on the "Outdoors with Joey Mines Show". The show was about the different techniques and tactics of floating rivers and fly-fishing for smallmouth. Randy Ratliff is on the Pro Staff for Hyde Driftboats, Star Inflatables, and Frog Hair/Gamma Technology Products. For more information on Randy and his guide service visit his web site at www.trout-fishers.net.